We are committed to respecting the privacy rights of all visitors and donors to our website. The following information details RJCA’s collection, protection, and use of the data we receive from donors and visitors to this website. RJCA recognizes the importance of protecting information given by visitors and donors to our site. Our policy is to use the information we acquire from visitors and donors for internal purposes only, and we maintain appropriate security measures to keep this information private. Users can visit the site without revealing any information about themselves. If you choose to give us personal information via the internet for the purposes of correspondence, processing a donation, or registering for an event, the policies below explain how we will use and protect such information. RJCA will remove your name from our mailing list at any time at your request. We will not sell, rent or trade your email address to a third party. We occasionally send updates to supporters who have given us their email address. Recipients are given the option to remove their names from our email list at the bottom of each email update. Again, we will not sell, rent or trade your email address to a third party. RJCA’s online and offline payment processing systems comply with PCI Security Standards, a set of comprehensive requirements for enhancing payment account data security. For more about these standards, click here. Our online payment processor, Authorize.net, hosts our secure giving and event registration pages on PCI Compliant servers and uses high-grade encryption and the industry-standard https security protocol to ensure secure transactions. Independent external and internal audits ensure the privacy, security and appropriate processing of your information on our site. Because refund policies may vary from event to event, the refund policy will be stated on the registration forms for individual events and handled on a case-by-case basis. Web browsers tell us the type of computer and operating system our site visitors are using. We’re also able to learn the domain where our visitors come from. We may analyze this data for trends and insights. We may also use tools like Google Analytics to examine data about our site visitors. Both of these services tell us information about technical aspects of our visitors’ computers and some demographic information. We use this information to improve our content and structure, leading to a better user experience. We do not receive any personally identifiable information from you unless you provide it. 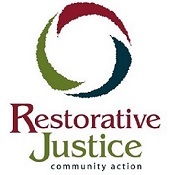 Restorative Justice Community Action (RJCA) improves community livability through restorative justice practices through the use of volunteers as facilitators and community representatives. RJCA is a 501(c)(3) nonprofit. Gifts are tax-deductible as allowed by U.S. law.